Swedens 3rd largest city; Malmö shows the rest of the world just how it's done. In the mid 1990's Malmö City council made an extremely significant descion to take action as the failing industrial economy was crippling the city. Industry shut down rendered large areas of the city unuseable and previously wealthy suburbs had become derelict. To fix this, a descion was made to transform Malmö into a modern, sustainable city with a knowledge based economy. One way Malmö acheived (continues to acheive) this transformation was to turn failing areas of the city into sustainable, smart suburbs. 2 differing examples are; the refurbished Augustenborg 'Eco City' and the newly created residential area of Western Harbour. The city implemented 2 simple policies which force devlopers to include bio-diverse, useable green space in new residential construction. The results are having a substantial affect on both environmental and living standards in Western Harbour. The Augustenborg Eco City is essentially a large scale refurbishment of an ageing 1950's suburb. The area which, in more prosporous times, housed local industry workers was becoming run down and unappealing. The many 4-8 story council owned apartment buildings were extremely cold in winter and highly energy inefficient. To add to this the area often suffered severe damaged caused by major flooding. Malmö city council saw and acted on the need upgrade this area into a more livable, more environmentally friendly suburb. Several projects were implemtated from the late 1990's into the 2000's to acheive the 'Eco City'. This included the upgrade of existing apartment buildings. The buildings were made more thermally efficient by simply adding insulation, then an extra layer of cladding on the outside of the building, as well as replacing the old windows with new. 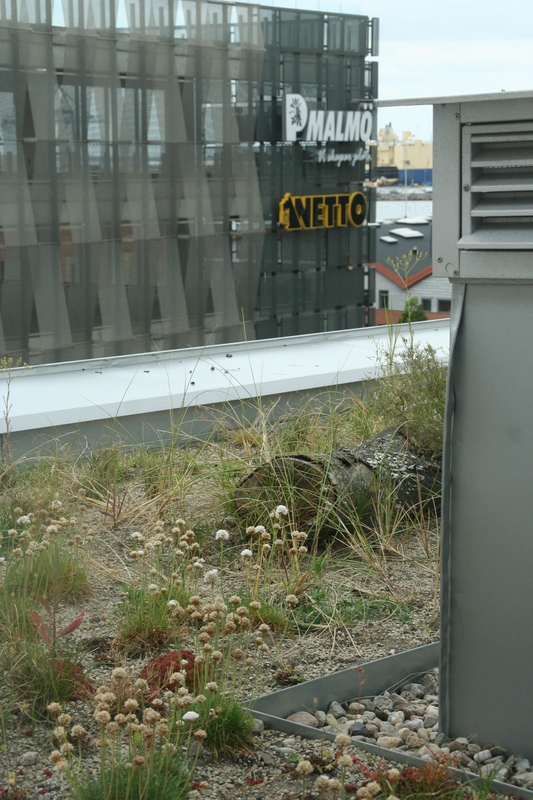 To negate the flooding a new open storm water system was installed, more green permeable spaces created, and over 10 000m2 of green roofs installed for water retention . 1km north-west from the centre of Malmö, on the Öresund Sound an amazing transformation continues to take place. What was a contaminated, disused shipping yard is becoming a thriving, green suburb of knowledge and sustainable living. Western Harbour hosted the 2001 European Housing Expo. The expo kick-started the sustainable urban development called 'Bo01'. 'Bo01' laid out the initial quality standards for construction within the development area. The guidelines which are enforced in Western Harbour today follow those ideals. Lately the focus has been on four aspects of sustainability, including high quality architecture, social sustainability, economic sustainability and ecological sustainability. They allow for creative and individual design, while supporting the common goal to create dwellings with significantly low energy consumption. Thus leading to a sustainable urban development with character and flair. The most interesting urban planning strategy to come from 'Bo01', which will surely have a long lasting legacy is the Green Space Factor. The Green Space Factor is a policy used by the city of Malmö to ensure a certain amount of green area is included in the design of new residential buildings. The city of Malmö highly values the importance of green spaces in the urban environment, stating in it's general plan that, 'The aim is to contribute to good living conditions for humans, animals, and plants'. 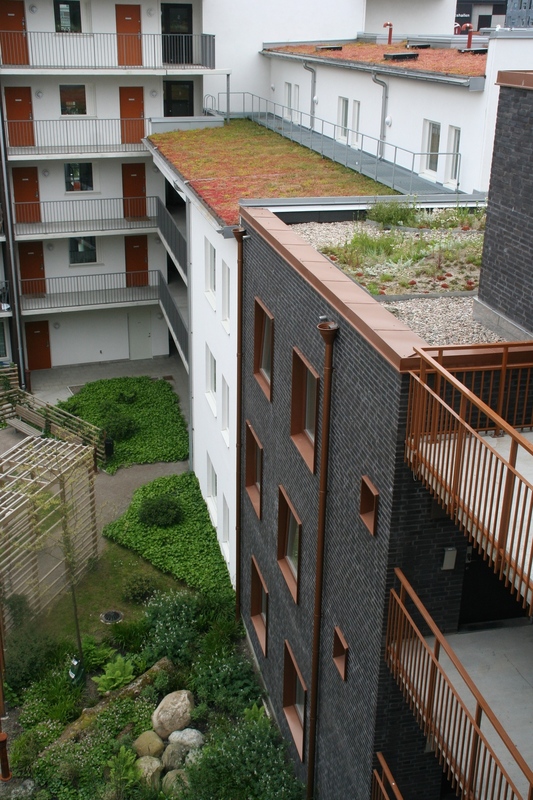 The Green Space Factor acknowledges courtyards as well as green roofs and walls as green spaces. According to the council, including these green areas in the construction will have numerous long term benefits- including improved local climate, noise reduction and reduced risk of flooding. The result is a truly, physically green urban development, providing numerous benefits to both environment and residents. The Green Space Factor and Green Points program are a terrific examples of successful urban greening policy.